All American made sport dry erase boards from OptiMA Inc. manufactured using our exclusive Opti-Print™ method providing you with a crisp and clean image and an outstanding dry erase writing surface. 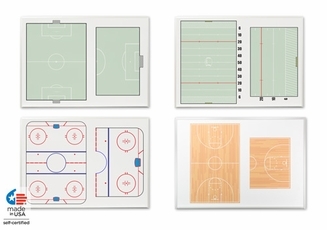 We carry dry erase boards and other dry erase options for basketball, football, soccer, baseball and ice hockey but anyone of our products can be customized to fit any other sport that you have in mind or created with your school or team logo. 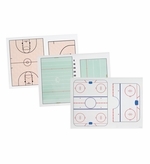 To help you find exactly the right product for you we have broken down our sport dry erase boards by sport; ice hockey, basketball, football and soccer. 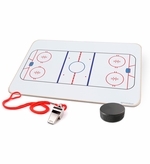 We also have our products listed by the type of dry erase board that you may be looking for including hand held, wall mounted or even portable dry erase magnets all printed with your favorite sport. 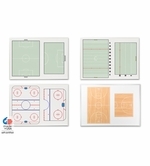 Our hand held coaches lap boards are an extra-large, double sided 12" x 18" with a print of a full-sized court or field on one side and a blow-up section of the goal area on the back side. 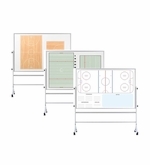 Dry erase locker room boards are a full sized, aluminum framed 32" x 45" dry erase print available in either an economical non-magnetic format or a premier magnetic receptive format if you want to use magnetic accessories. Each board ships with installation hardware. Dry erase sport magnet prints is another of the unique, American made, OptiMA product lines that we offer. These large, roll up printed dry erase magnets measure 30" x 42" and stick securely to any steel or magnetic receptive surface like lockers giving you a portable dry erase surface that you can take on the road. Brackets for up to 64 teams on a 2'x3' dry erase board. Fully customizeable!